Melt 3 tablespoons of butter in the microwave for 45 seconds. Stir in 1 (10-ounce) bag of miniature marshmallows; evenly coat with melted butter. Heat in microwave for 1.5 minutes or until marshmallows are melted. Add green food coloring until you get the desired shade of green you’d like. I added about 3-4 drops. Mix 6 cups of Kellogg’s® Rice Krispies® cereal with your melted marshmallows. Spray your hands or a spoon with cooking spray and firmly press into donut mold. Remove from mold and decorate with holly and berry candy pieces. 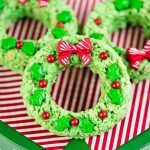 Use icing or frosting to add the candy bow to your wreath. Allow wreaths to sit for at least 30 minutes.